Counting Sheep was recently presented at the St. Vladimir Institute in Toronto. The Lemon Bucket Orkestra have never been very good at fitting into boxes – as Balkan, Klezmer, gypsy, punks they always somehow defy convention. Leaping off stage into crowds during a performance to lead a dance circle or leaving the venue all together to busk along the sidewalks of Queen West – these guys can’t be fenced in. So it’s no surprise that Lemon Bucket’s first venture into the theatre world is a hard piece to define. 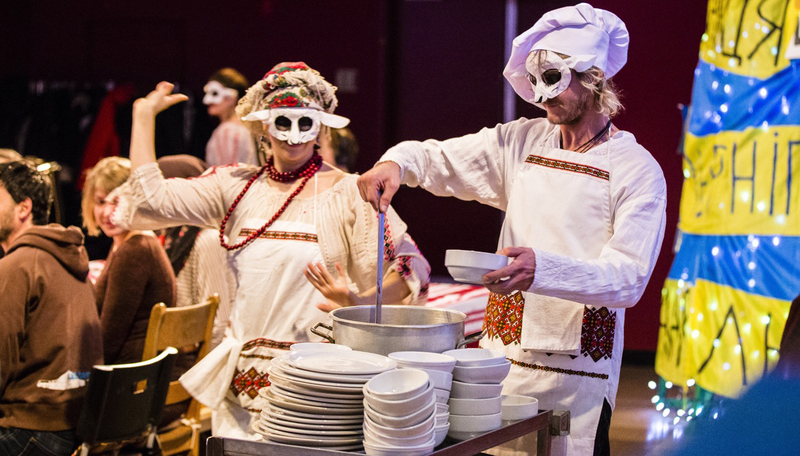 Part concert, part sing-along, part play, part dinner theatre, Counting Sheep masterfully weaves together music, dance, and video in an immersive experience that puts the audience in the middle of Kiev’s Maidan Nezalezhnosti during the 2014 uprising in Ukraine. The play, co-written by Lemon Bucket front man Mark Marczyk and singer/ethnomusicologist Marichka Kudriavtseva, is loosely based on the two’s real-life love-story which takes place against the backdrop of the demonstrations in Kiev. “I saw Marichka my first day at the Maidan, she was on this massive stage in front of a village of people, singing in the Bozhychi folk choir,” says Marczyk. The two quickly bonded over their love of Ukrainian folk music and their passion for recording the stories they heard in the Maidan. Counting Sheep is the byproduct of their writings, observations and recollections from those days. The performance has very little dialogue and the words that are spoken weave together various languages: Ukrainian, English, Russian and a bit of Spanish. For most audience members, who may not speak all these languages, the piece is more about feeling your way through the experience than thinking your way through the somewhat fragmented history and narrative. The songs in the play are from the central and eastern region of Ukraine, called left bank, an area severely impacted by the war. Kudriavtseva documented many of these songs, which were in danger of being lost, through her travels in that region. Counting Sheep was an opportunity to share these pieces with new audiences. “We chose to tell the story through these folk songs because we wanted to highlight some of the deep rooted traditions of the people who are fighting right now,” says Marczyk. For the pair it was important to showcase the rich cultural history of the region. In many ways the piece is a testament to the power of the human spirit to find love, joy, music, art and community under the most unexpected circumstances. A projector flashes images of folk-dancing crowds in the middle of the protest zone, couples tying the knot and a pianist serenading protestors. Audience members are taken on a journey from a Christmas Eve feast filled with joy and jubilation to the dark days of Ukraine’s uprising. 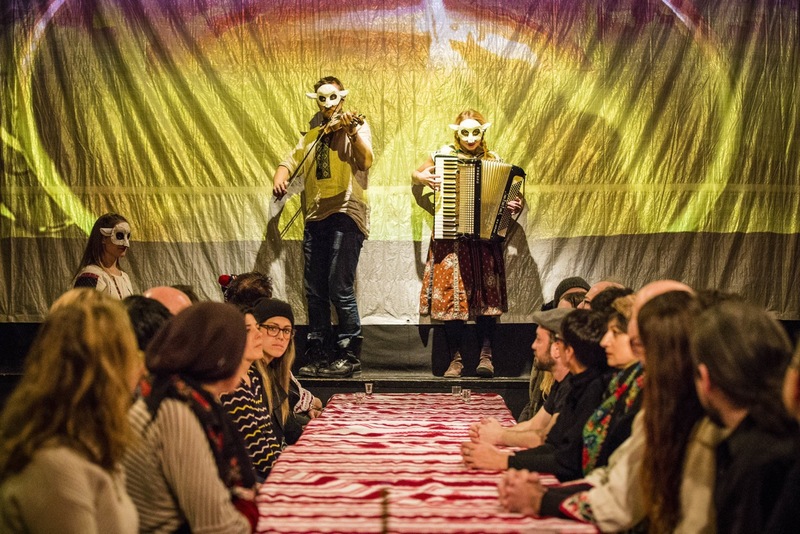 The experience is immersive with audience members first breaking bread and sharing a dance with cast members to later building forts and throwing bricks at riot police. Quickly, joy, community and solidarity dissolve into fear and desperation as a young girl screams for help, another woman cries over the bloody body of her lover beaten up in clashes with riot police, and protestors evolve from ordinary citizens to armed soldiers. Despite its revolutionary backdrop, Counting Sheep is no propaganda piece – romanticizing a black and white struggle between the oppressors and oppressed. Marczyk admits that the political situation in Ukraine is incredibly complex and confusing. He says as the situation evolves, many people are switching sides, abandoning their former ideas. “That’s one reason we call the play Counting Sheep – everybody is a sheep of one kind or another – everyone wears a mask – it’s human nature to join a herd,” says Marczyk. In the spirit of reflecting the reality of the struggle, Counting Sheep has no definitive ending. “The political situation in the Ukraine hasn’t ended, there is no conclusion, it’s still going on, there’s still an invasion, hundreds of thousands have been displaced,” says Marczyk who wants people to use the play to generate dialogue about the future of Ukraine. Despite the specificity of the regional folk songs, Ukrainian language, and footage from newsreels that ground the piece in 2014 Kiev, Counting Sheep resonates on a more universal level. The play’s themes of human resilience, the struggle between citizens and the state, and the quest to build community, could be about Egypt’s Tahrir Square, Iran’s Green Revolution or New York’s Occupy movement. Ultimately the play is the best example of how to create a multidisciplinary, immersive experience that speaks to the power of art and community in times of social and political change. This article is part of our issue OUTPOSTS: Ventures Outside the Box.